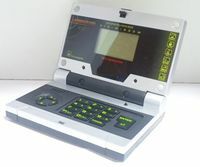 The DigiWindow (デジウィンドウ, Dejiwindou) is based on the small laptop used to analyze digimon carried around by Thoma H. Norstein in Digimon Savers. It was released the 30th of August, 2006. 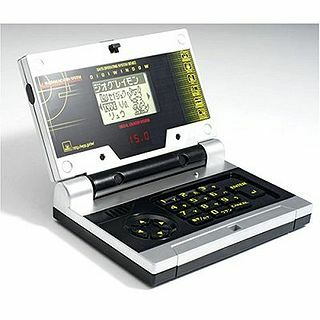 The DigiWindow is the Digimon Savers equivelent to the Digimon Analyzer. 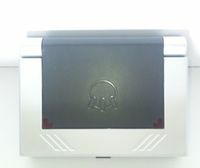 It is a device that allows you to connect your Digivice iC Toy and unlock new digimon. Game 1: Given a 3x3 grid - on one square there is a skull. Press the number from 1-9 in the corresponding position on the keypad. Repeat three times before the time runs out. Game 2: Nanimon lights the fuse on a bomb, next to the Digimon you're trying to get. The defusing combination appears along the top. (It can include the arrow keys.) Enter it on the keypad before time runs out. Game 3: Poops are falling from the sky. Move your Digimon left and right to dodge them. Avoid being hit until the time runs out to win. Game 4: Given four arithmetic questions over two pages (answers are one or two digits). Enter the correct answers before the time runs out. Game 5: Your Digimon is moving to the left and has to jump over poops. Press Up to jump, and Enter to move an extra step forward. Hitting a poop causes a delay while your Digimon recovers. Get to the end of the course before time runs out. Game 6: Your Digimon and another are having an eating race. A row of randomly ordered food and vitamins appears to your left. Press Enter to take a bite of food and Left to take a bite of vitamin, depending on what's at the front of the queue. (If you hit the wrong one, you don't eat anything.) It counts how many you and your opponent have eaten. Eat more than your opponent to win. Game 7: You are given a Digimon name in Japanese with one letter missing. Input the correct letter to win. Game 8: A Digimon quickly moves across the screen, then you're given a choice of four names (again, in Japanese). Select the correct name to win. Game 9: Given a 3x4 grid, with 3 dark squares, which you have to copy on the keypad (the whole 3x4 section) within a very short time. If you do it right, you blast the other Digimon and catch it. Game 10: Your Digimon faces another one, and two symbols appear at the top of the screen. These symbols correspond to Rock, Paper, Scissors. (The age-old Paper beats Rock, Rock beats Scissors, Scissors beats Paper.) If your Digimon has the winning symbol, press up. If your Digimon has the losing symbol, press down. The winner fires a fireball and the loser defends. Repeat until you defeat your opponent. Additional Digimon can be obtained through the Digimon Pocket Wars and then sent to the DigiWindow. This page was last modified on 22 November 2017, at 07:01.